It has been confirmed that former Super Eagles of Nigeria striker Obafemi Martins will be out of action for up to seven months with a partial rupture of the quadriceps tendon of the right knee which he sustained in his club’s Asian Champions League tie against Kashima Antlers on Tuesday. Obafemi Martins played for just 22 minutes before he got injured, presently the medical team of the club is doing everything possible for Martins to undergo surgery as quickly as possible. 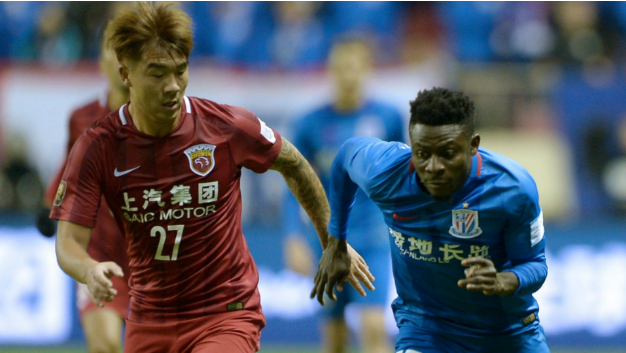 Obafemi Martins who scored a hat-trick for Shanghai Shenhua in a Chinese Super League last week in a 4-2 thrashing of Hebei China Fortune would need at least 6-7 months to recover from a surgery. Martins in recent times have been mentioned as one of the players that should be given a chance to fight for a spot in the Super Eagle World Cup team since the current team seems to lack experience required to compete at the World Cup level. This injury, however, has laid to rest any hope of Obafemi Martins featuring for Nigeria at the World Cup. The 33-year-old played for Nigeria at South Africa 2010 World Cup and made two substitute appearances against Argentina and South Korea, Nigeria could not advance beyond the group stages. Obafemi Martins has been a hit in China since joining from Seattle Sounders in 2016, Martins will be a big loss for Shanghai Shenhua. Martins is a well-traveled player and has previously played for clubs based in Italy, England, Germany, Russia, Spain, United States and China.